As a child, I grew up quite often being curious about Japan. I stumbled upon some anime films on SBS whilst very young and of course this unique language of storytelling would stick with me. Things like Nintendo and shows such as Neon Genesis Evangelion were a big childhood influence. High school opened up the doors of Japanese cinema – Akira Kurosawa’s Seven Samurai was the first foreign film we studied. The attention to detail and style sucked me in. It wasn’t too long before I discovered the likes of “Beat” Takeshi and Takashi Miike. Recently I’d decided to immerse myself more into Japanese culture and decide to learn the language and head over there! First stop was the food capital Osaka – and it totally lived up to its name. My friend Chris and I stayed in Dotonbori and it was amazing to see all the life bursting out of the place. The evenings really explode with energy from all the signs and folks out to have some fun. I was constantly amazed by all the tiny bars and restaurants. We had our best ramen and sushi in Osaka and even managed to bump into an old actor friend who had moved over to work at Universal. He took us to a bar that played “noise” music and this was where I had my first conversation in Japanese. Even with the extremely basic amount, I knew we managed to chat about bands with the bartender. 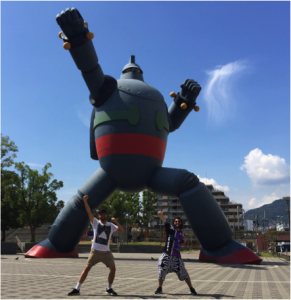 We fit some quick trips to Kobe and Nara – Kobe offered easily the best beef I’ve ever tasted and the ever-strong Tetsujin 28 who was built (from the anime character) after the great earthquake to symbolise Kobe’s strength in tough times. A local of Kobe even walked us there as he’d never visited it! Nara was fun to get so close to all the friendly deer. Kyoto we found ourselves in Higashiyama. While it’s traditional aspects are stunning and have a calming vibe to them, I was surprised by how lively the nightlife is. Funnily enough, some nightclubs actually played some popular “Melbourne Bounce” songs which was amusing to dance to in such a different part of the world! Shirakawa-Go took a train and a bus to get to but is extremely worth it. The town’s world heritage listed and its houses built with hatched wood. They are traditional and gorgeous. I really recommend staying at a Ryokan here. We spent one night in this old-style house and went to sleep with the local river next to our room. They served us a traditional dinner and breakfast which was fantastic – it was all locally sourced and delicious. I asked a local resident to take a photo of her farming to which she kindly replied “douzo onisan!” No idea why she called me ‘big brother’ but it surprised me to be referred to as something so welcoming. Our last stop was Tokyo and it’s all you could imagine. Harajuku is full of boutique street fashion. Avoid the tourists on the main strip and go to the side streets to find the real gold. All the folks who work at the stores are the kindest sales people you could meet and give some of the best services in the world. Managed to go into a bar at Golden Gai which I’d felt I’d been to before – but in a video game! Actually spoke to the bartender/owner about it and turns out the director is the best mate of his. He even put on a record with some of the game music on for me. Also went to a Maid Café in Akiba and taught our maid/waitress some Australian slang! It was an amusing cafe where all the sweets and drinks are super Kawaii. It was pretty funny. There’s so much more I could say but in the end, it’s all about going your own path and creating your own adventure. This trip really gave me a more solid understanding of the traditional and modern side of Japan, and I can’t wait to go back!